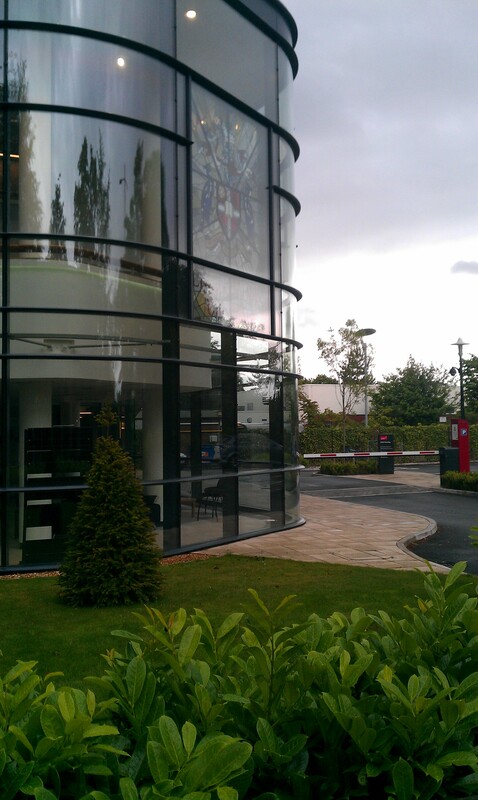 A couple of weeks ago I attended the ‘What’s the use of philosophy of education?’ workshop at Liverpool Hope University. The audio of my presentation can be found here and the slides on a recent blog entry. I was presenting the research paper which myself and Markus Deimann are working on the moment. Presentation of the paper went quite well – with a jointly authored paper it’s nice to feel that one has a reasonable grasp of the whole – although it did feel like 20 minutes wasn’t really long enough to explain the idea to an audience that wasn’t necessarily familiar (or indeed sympathetic) to open learning. There were some concerns expressed about the paper supplying form but not content. I think it would improve the paper if we had some more detailed analysis of examples of open learning to show how theory and practice might knit together rather than simply appealing to sympathetic notes between OER and Bildung. There are a few different ways one might approach this. At the moment, I think we could make a case study of MOOCs or of OLnet itself, taking care to show that understanding these phenomena within the context of Bildung helps us to make sense of them and show how they can be developed. Although it didn’t really come up at the workshop (perhaps because I didn’t go very far into it) I think we need a clearer conception of what we mean by Bildung as it’s quite a complex term. It’s not really enough to say that the word cannot really be translated while proposing to use it as a tool for explanation! Is Bildung a theory of education or a challenge to theories of education? While we cannot answer all these questions within one paper, it seems like we need a bit more specificity. However, at this stage in the research it’s more about exploring ideas and synergies rather than offering proof (which seems to me more like a follow-up piece of research). As Markus noted in his own reflections on presenting the research, we are bringing two concepts together rather than trying to prove an idea. We have submitted the paper to Open Education: Beyond Content so perhaps we will get the opportunity to develop the paper before then. Here are my notes (and opinions) from the rest of the day… I hope they are a reasonably faithful representation of what was said and thought. 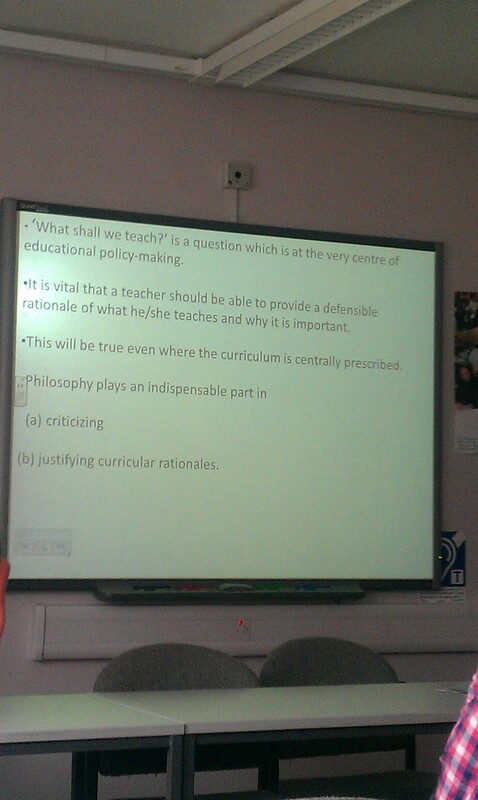 Paul Standish (Institute of Education): What’s the use of philosophy of education? 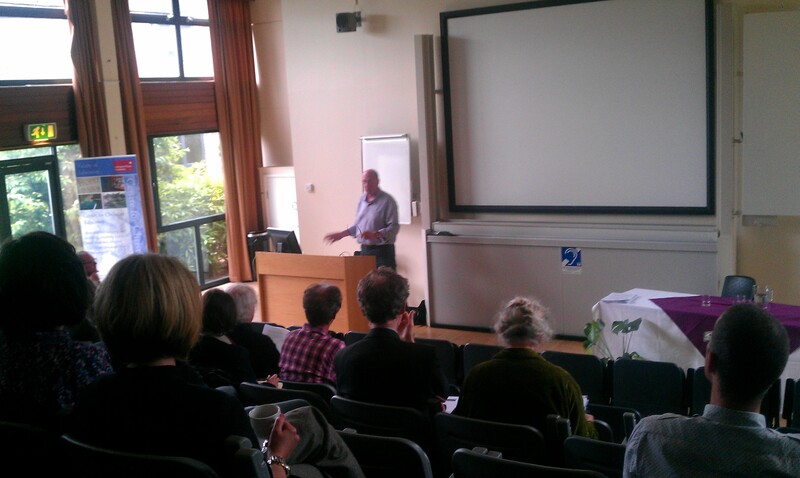 Standish – who recently published a book on Cavell & adult learning – began with a discussion of ‘use’. ‘Use’ connotes utility and recalls notions of instrumentality. However, ‘use’ can refer to a wide range of different kinds of relationships (e.g. ‘use’ of typing, football, literature, people). Notions of use can relate closely to the language of aims and objectives which has a special place in education policy. Standish went on to show Raphael’s painting of Plato’s academy (1509) which I have discussed elsewhere, highlighting the Platonic/Aristotelian sides of the painting. He spoke about the various geometrical and theological points of interest of the painting, claiming that it could be seen as a dynamic genealogy of thought. Philosophy thus construed is a kind of educated conversation. Plato holds the Timaeus and points heavenward while Aristotle clutches his Ethics. Philosophy of education can be understood in a similar way. In 1962, R. S. Peters is appointed to the chair of Philosophy of Education at the Institute of Education. He introduces the rigour of analytic methods into the philosophy of education. He also established the PESGB and the Journal of Philosophy of Education (1966). Peters’ method (inspired by Locke’s ‘underlabourer’) was to use conceptual analysis to uncover the logic of education and the underlying educational reality (logical atomism). The PESGB defended a liberal model of education, and the ideal of rational autonomy. In the post-war years we saw a growth in the ‘disciplines’ (including philosophy), partly as a result of them being embedded in teacher education. Many students found philosophical study dry and challenging. Conversely, the ‘disciplines’ themselves are suspected by government of being critical and subversive. Since 1980 there have been fewer positions in philosophy of education. Some of the figures in the painting of the Academy are disruptive, such as Heraclitus who leans on a block of stone that is out of joint with the other angles. He also represents Raphael’s competitor, Michelangelo, by being dressed as an unkempt workman. On the extreme right of the picture we can see a self portrait of Raphael, who takes no part in the discussion but looks out instead on the viewer. These two subversive elements act against the order of the picture as a whole. Standish claimed that philosophy of education is neither applied philosophy, nor a branch of philosophy, nor an amateur pursuit, noting that professionalization of philosophy need not be a positive thing. In the 1960s, philosophy of education provided part of the practical substance of initial teacher education (ITE) and continuing professional development (CPD). This has been superseded by the technicization [?] of education. However, it remains the case that philosophy can develop the practical reason we use in teaching while addressing its existential challenges. Teaching is about being exposed to others and we shouldn’t try to ameliorate that. Philosophical questions are simply unavoidable in the practice of education: hence philosophy as educational research. Philosophy should be fully engaged with the interpretation of research data (this is construed as an ethical matter; we should avoid reducing ethics to research ethics). As in Dewey’s dynamic metaphysics, we should be committed to an idea of education that is in constant flux and development. At the centre of educational policymaking is the curriculum. Every teacher should be able to provide a rationale or defence of the material they teach and why it is important (even in the case of curricula which are centrally described). Philosophy plays an indispensable role in a.) critique and b.) justifying curriculum rationale. All educational policies contain ideological assumptions. In the absence of a ‘god’s-eye’ view, our assumptions must be subjected to criticism (nb. PERL group criticism of ‘managerialism’). Philosophers have always struggled with the legitimization of their activities as a profession. Constructivism is much more popular in education than it is in philosophy. Danka argued that this is mainly because some of the insights of constructivism are quite practical and strategically useful although some of the arguments are quite weak from a philosophical perspective (esp. in philosophy of science where it is associated with extreme relativism). White began by outlining two conceptions of citizenship: the ancient Republican tradition and the modern liberal understanding. White contends that the purpose of the university is better suited to the Republican view on the grounds that the liberal model equivocates on the boundaries between public and private life. Modern political thought tends to distinguish citizens from the state. The drive toward ‘efficiency’ reduces capacities for action and encourages consumer-style, instrumental responses. Walzer (1980: 159-160) advocates a notion of ‘democratic play’ which allows the development of the skill of political citizenship by reflecting and discussing the political actions of others. This helps us to come to a better understanding of our rights, duties and obligations, reinforces individual autonomy and develops our sense of ‘worldliness’. Higher Education has been drawn within the remit of the welfare state. It cannot now claim to be the preserve of an elite as it exists as an agency of the state among other services. The university is a special kind of public service because it promotes the very idea of citizenship (and presumably it thus needs to be treated specially). Harrison presented a series of moments from history which described the arrival and normalisation of Christianity (597-1400). This was then reframed as a way of constituting the Christian subject (ends, means, subject, relations to self/other, obligations). During the Enlightenment many aspects of this form of constitution were challenged. The modern educational subject is ‘aspirational’: using state organised schooling or ‘technologies of the self’ to improve their economic and social standing. Overall this seemed to me to deviate from Foucault… not least in the attempt to write a contemporary ‘history’. The modern climate of education is characterised by control and technocracy, and threatens to undermine the faculty of practical wisdom. Lewin believes that instrumental rationality may well be ubiquitous, but also that we don’t fully understand its dehumanising effect. Educational standards typically show consistent improvement regardless of whether they correlate to our experience of education. From this perspective, the philosophy of education has failed. Technology is too often seen as a value-neutral tool that can meet the high expectations which policymakers place upon it. Lewin provided an example of what he terms technological thinking: contemporary moral philosophy is stuck between utilitarian and deontological approaches, both of which attempt to obviate the need to make judgements. (Lewin calls these ‘sciences of action’.) However, ethical action cannot be determined in this way. Virtue ethics resists this reduction. 20th century of virtue ethics focuses on the development of moral character. Technological modes of thinking – like ‘managerial’ approaches – emphasize means while obscuring ends. Nixon began an interesting presentation with a discussion of Arendt. Arendt was clear on the idea that thinking is not equivalent to action (though it is related to it). By her own recognition, the greatest thinker she had ever known (Heidegger) had acted very badly. Eichmann acted abominably, but in he thought he was banal. In her final work (‘Mind’) Arendt explores the ways in which the gap between thought and action might be filled with ‘judgement’. Aristotle distinguishes theoretical, practical and deliberative forms of thought. Philosophy is ordinary and grounded in the human capacity for thought. We need to recognise philosophy as a commonplace form of language use and reason. Any attempt at interpretation is a construct which has already been interpreted and reinterpreted. If all understanding is already interpretation then the interpreter is implicit in the object of interpretation. [Gadamer] If all understanding is already interpretation and the interpreter already a part of what is being interpreted then all understanding involves some aspect of self-understanding. [Gadamer] The hermeneutical task is to locate oneself within the ‘hermeneutical field’ or tradition of understanding. Hermeneutical priority of the question: understanding begins when we are receptive to that which addresses us. The essence of the question is to open up possibilities. We can understand intellectual discourse as a kind of question and answer. Gadamer’s contribution to the hermeneutic tradition is to show that phronesis is not based on technical knowledge but a mode of ethical reasoning which requires an understanding of the common good. Fusion of horizons – expressed superior breadth of vision that someone who aspires to understand must have. Nb. Legacy of past to future and the corresponding debt owed to the past by the present; our horizons are mobile, never static. Power of Prejudice – what one brings to interpretation is important. We understand the world through and within our interpretation of the world. What is the ground of the legitimacy of prejudices? Prejudice is where interpretation begins. We don’t methodologically extract our prejudices; we begin with them. The ethical part is not our prejudices but the way we deal with them discursively and hermeneutically. Beyond method – methods are not a guarantee of understanding: “of course there are methods… as tools methods are good to have… but methodological sterility is a well known problem”. Without hermeneutic imagination the person who applies the same methods will never learn anything new. Implicit here is the idea that self-interpretation is open-ended while method implies an unchanging, ‘objective’ validity. Even the methodology derived from the natural sciences is based on an interpretation. What would policy look like from the perspective of the hermeneutic tradition? Policy formation might be understood as an ongoing, deliberative process which is comprehensive, synthesizing, engaging and perpetually under scrutiny. It seemed to me that there were a number of symmetries between the policy of hermeneutics proposed by Nixon and the OER/Bildung crossover; it’s reassuring to find someone thinking along similar lines! However, philosophical questions about education are as old as philosophy and arise in culturally and practically diverse contexts. There are many other proposed approaches (including Bildung and Marxism) and this variety is healthy. This seems in need of nuance – utilitarianism, for example, is often thought by utilitarians to a reconstructive rather than directly action-guiding endeavour. Thanks for such a comprehensive and thoughtful overview of the papers and the discussions. You’ve captured so many of the issue and themes that emerged during the day. I think the idea of ‘bildung’ is central: the idea, that is, of ‘bildung’ as flourishing – the self-growing in reciprocity with others. The secularity – worldly – provenence of this age-old idea is to my mind of paramount importance. Thanks Jon. I thought your presentation was very interesting, as you can probably tell from the notes I’ve taken. As I mentioned to you after the talk, Habermas was greatly influenced by Gadamer (among others) and thus important for my own graduate work. Perhaps we can share thoughts around Bildung/hermenutics in the future… maybe when our paper has reached the next stage of refinement! I argued that philosophers have, over the centuries, provided such outlines. often these lurk below the surface where they are not subject to scrutiny). which are relevant to the present day.